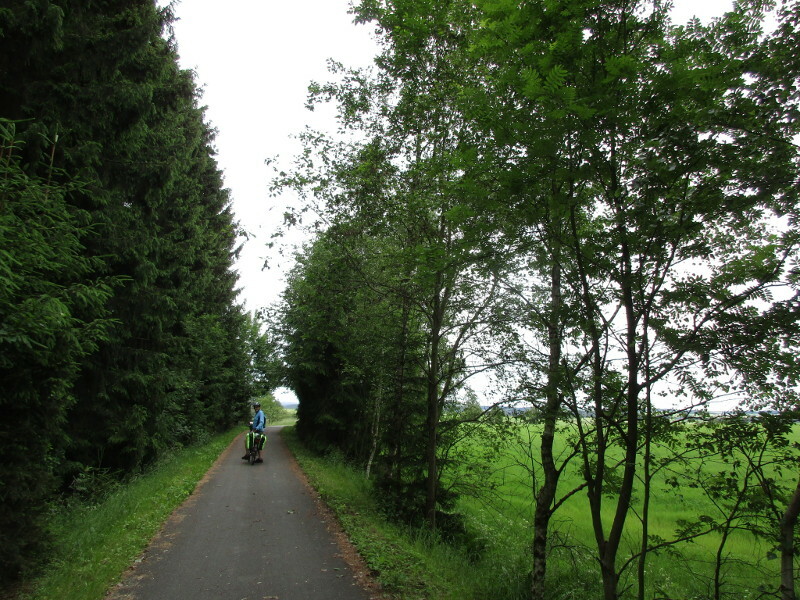 Today’s ride was a long one – 83km to Greiz. It was nice and cool in the morning, becoming hot again in the afternoon. It took the whole day, until around 3pm, as there were a lot of hills slowing us down. 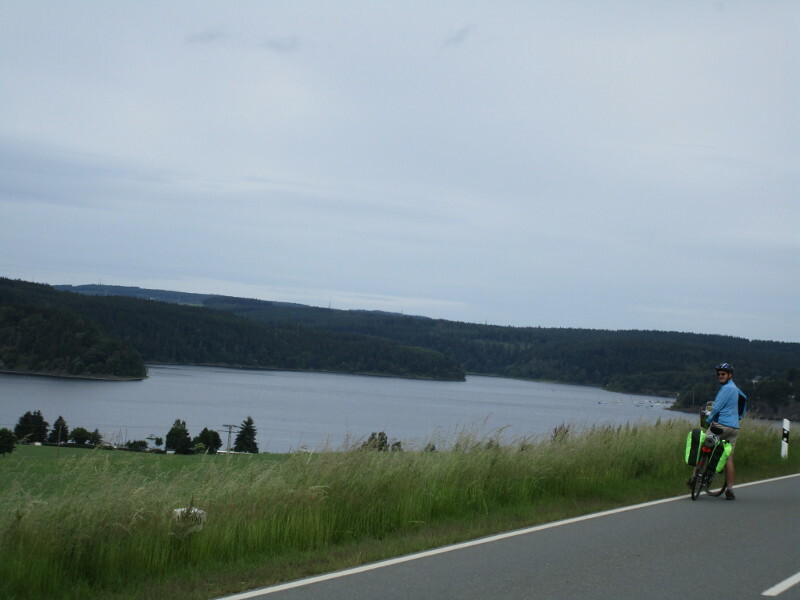 We had some big hill climbs through forests right at the start, we missed our planned route out of town and found ourselves at Lichtenberg. 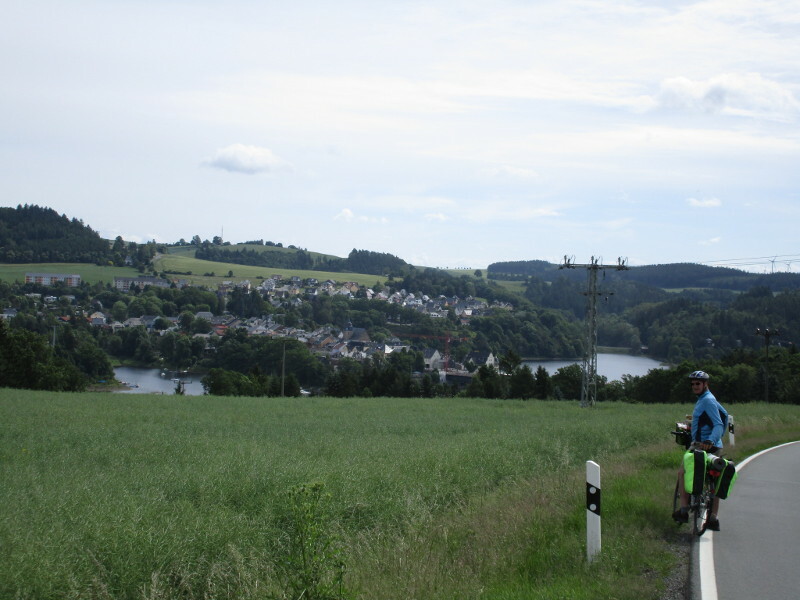 We by-passed the Saale bicycle path to ride through Lobenstein, Schonbrun, Eberdorf, Zoppoten – to Saalburg. Up to here there were lots of hills and it was hard work. They were repairing the bridge into Saalburg, but you could still walk across with a bicycle. 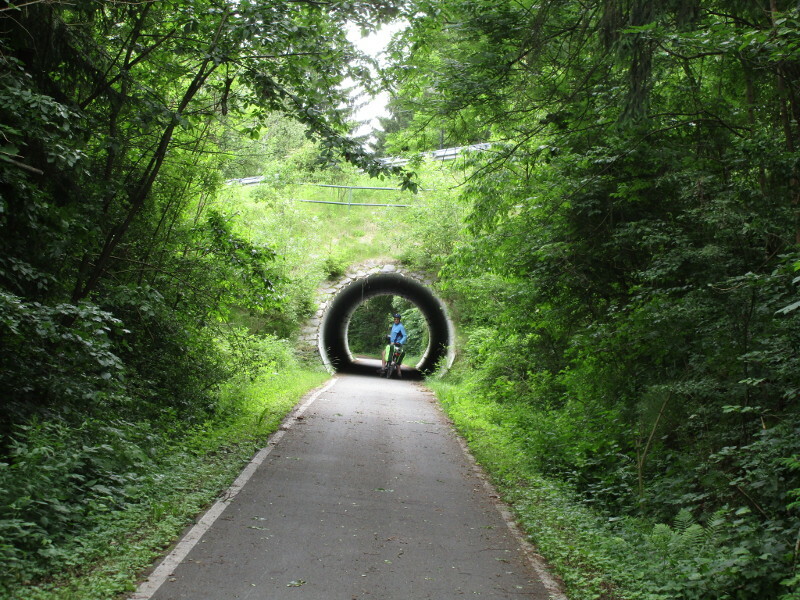 Then we were back on the Saale bicycle path – we cycled around part of the river that widened out with many bends. 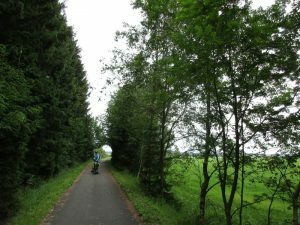 We found an excellent bike path built on an old train line – very comfortable to cycle on – called Radfernweg Euregio Egrensis. 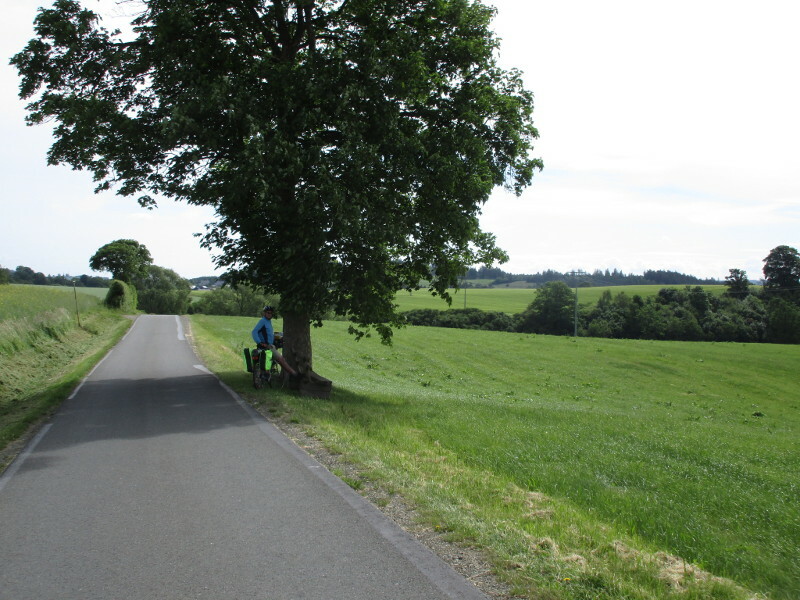 This took us almost all the way into Schleiz, where we had a pastry snack from the local Lidl supermarket. Then we worked our way to Oetersdorf and took a short cut away from the bicycle path through Lohma, Goschitz and Fortan (lots of nice down-hill runs). After Lavitz we were back on the cycle route again, but we may just as well have chosen our own small roads, as the cycle route followed the roads. 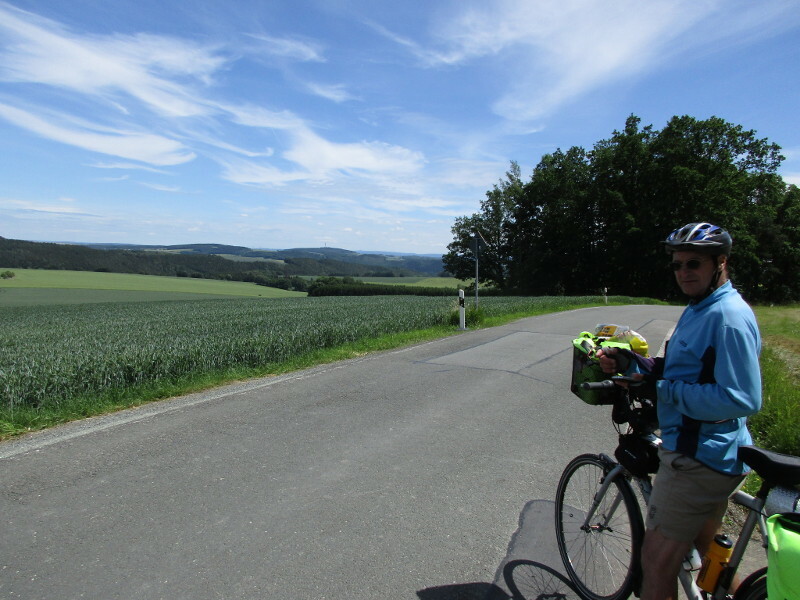 It started to get really hilly again just close to our Greiz, our target town. 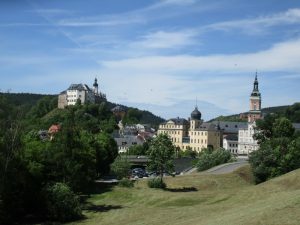 The town itself is also built over hills. It is very attractive town with a castle on the hill. 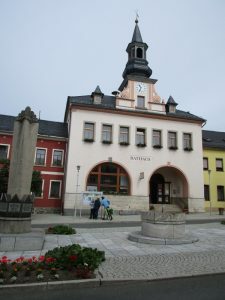 The town used to be in East Germany, and we noticed the East German Ampelmann on the traffic lights for the first time on this trip. We did a big shop at Kaufland and went to our accommodation which is an apartment. We managed to follow entry instructions (finding a key in a mailbox) and got in. The apartment has everything in it (kitchen, bedroom, bathroom), but is cramped with too many pieces of furniture – obviously it is someones flat and now they are renting it out. We enjoyed having the fridge to cool our beer and cheese and Sky TV/ CNN to catch up on world news. We didn’t have the energy to go back out into the heat and face the hills of Greiz for more sightseeing, so decided to view the town on our way out the next day.